In recent years I have become particularly captivated by the ways in which bodies are crafted into performances of poverty and need in urban spaces. In particular, over the past three years I have witnessed an escalation in the presence of persons in performance of homelessness and beggary in three cities to which I am a frequent long-term traveler. Leeds, United Kingdom, Leuven, Belgium, and New York City, United States each have their own type of nuanced performance template, yet there are some similar artifacts common to performances of poverty, homelessness, and beggary. These cities are transnational spaces of dynamic global mobility in which the arts, education, and business interact most dynamically in performances poverty and need. The staple artifacts of these performances are: 1 – the strategically placed pieces of cardboard (as signs, seats, and shelter), 2 – the cup/receptacle, for the collection of the money (often loose change) offered by passersbys, and 3 – the human body. It is to this latter artifact that my attention is mesmerizingly drawn. In these performances, the bodies of the human subjects are intentionally sculpted into living symbols of dread, anguish, and desolation. Physically positioned such that pedestrians are compelled to gaze downward upon them, in part out of necessity to avoid any unfortunate collision that would bring the pedestrian violently, but only momentarily, into the lowered world of concrete, cardboard, and disenfranchised bodies, these bodies are making profound inscriptions on the global urban landscapes. As appalling as it is that economies and social systems in privileged western spaces are experiencing decided levels of failure on several critical fronts to secure the provision of the most basics of human needs (food, shelter, and clothing), the twenty-first century performance culture has brought about intriguing and creative stagings of what I have come to call the art of performing poverty. They (the they who are the have-nots) are everywhere, uptown, downtown, east side, west side, midtown, the business district, the arts district, the commercial district. They (the have-nots who are visible) are of all ages: young, old (some are children with their guardians), middle aged, ageless. They were almost every one: Black American and/or British, white American and/or British, Latino/a, European, Gypsy, Middle Eastern, Eastern European, East Asian, Southeast Asian and varying mixings. They were gendered, male, female, (and I suppose transgendered), all are sexed. The cardboard signs with thick black marker writing revealed that: She was pregnant for the first time and homeless, he had lost his mother and only needed money to get to her funeral in Ohio, she would her dog fed first, he just wanted bus fare, she needed money for food, he need money for his daughter, she was just trying to get to the next county, his mother was just diagnosed with cancer, they had been burned out of their home, they had lost their apartment when they lost their jobs, he just need enough find a place to sleep for the night. The palm of her hands are in a traditional Christian prayer pose and her forearms squeezed together, her forehead rests on her thumbs, her head is positioned downwards and her eyes appear closed, she is on her knees on a piece of cardboard. She is still. Frozen in time and spaces. He is on his hands and knees with his forehead pressed against the cardboard which is on the concrete street beneath him; his body is folded over and one hand cupped at the side of his head. He is captured in a place where time has stood still. Human bodies in the art of performing poverty make productive use to urban landscapes, producing stillness and pause in the midst of bustling somatic ecology of the urban global. This results in the necessary creative tension and critique essential for igniting social accountability, reflection, and of course, productive audience guilt. She tucked her head under the brim of her baseball cap so her face and eyes could not be seen, but she could on occasion peer out. Next to her was a dog (one of those small ones)black and copper cuddled inside a sweater (or maybe it was a small throw), which sat on top of a piece of cardboard. The cardboard providing insulation against the cold February concrete of NYC winter. She too sat on a piece of cardboard, with a cardboard sign in front of her: ‘Hungry’. 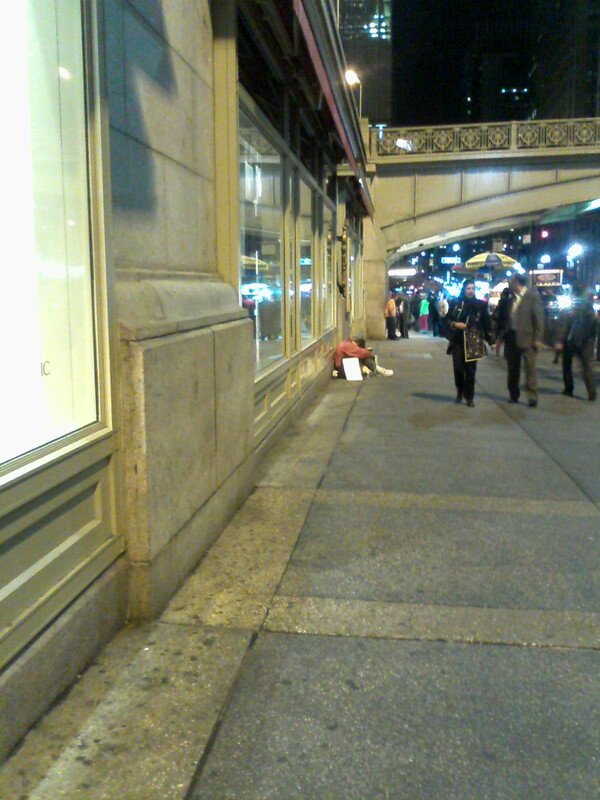 (I believe the ‘cold, homeless, and not particularly having a blast out here’ are implied. As she sat she read a book. It was difficult to see which book. Her pale white fingers covers what evidence of a title would have been possible from the angle with which I stood. Before, or while, placing two dollars in quarters in her cup, I asked ‘may I take a picture of you? Not your face but arrangement here’. Without hesitation, she said ‘no, but thank you for asking, most people just take without my permission.’ And I could hear the sense of deep violation in her voice, and see it in her demeanor as her shoulders curled forward and her chest receded inside her frame. At and earlier point in the day, I asked the young man above if I could take his picture. He said ‘sure’. His bold unapologetic demeanor, along with his well packaged belongings may indicate that he has not been at this way of life for very long.